It’s entirely possible, and often desirable, to remove unwanted, embarrassing, or questionably legal images and videos from the galaxy Tab Gallery. 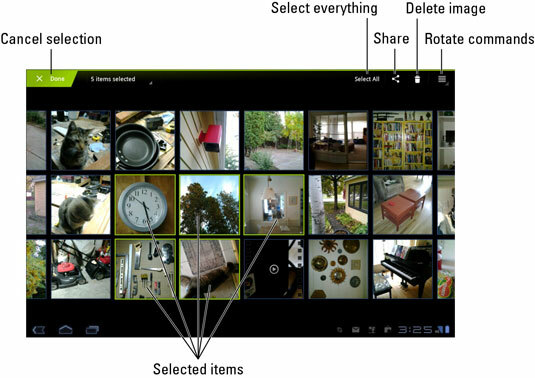 To zap a single image, summon the image on the screen and touch the Trash icon that appears in the upper-right corner. Choose the Confirm Delete command. The image is gone. Open the album (pile) you want to mess with. Long-press an image to select it. Instantly, you activate image-selection mode. Continue touching images and videos to select them. Perform an action on the group of images or videos.